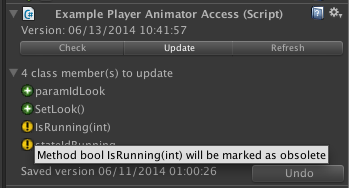 Note: This became deprecated with Unity3D version 5 with the introduction of State Machine Behaviours. 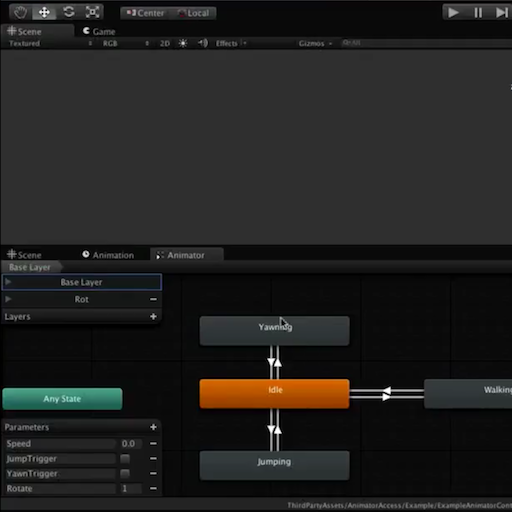 Aside from this it might be interesting because of some advanced techniques for code generation in editor scripts. On every run the code generator removes all methods marked as obsolete.So clean up is done by running code generation one more time. You don’t have to enter state or parameter names manually any longer as they will be generated automatically. Register event handlers on state changes or transitions that met predefined conditions. Using it will let the compiler detect most possible problems in your code, saving you time consuming bug analysis because of wrong hash IDs. Query Animator states by using explicit methods e.g. Provides dedicated methods for accessing every parameter e.g. Register event handlers to be called on Animator state changes or transtions e.g. Documentation as README.md and README-Advance.md or as PDF. "Base Layer.Walking -> Base Layer.Idle",.